In the wild west, the Outlaws hunt the Sheriff, the Sheriff hunts the Outlaws, and the Renegade plots in secret, ready to join one side or the other. Before long, bullets start to fly! Which gunmen are Deputies, ready to sacrifice themselves for the Sheriff? And which are the merciless Outlaws, looking to gun him down? The worldâ€™s best-selling wild west card game is back in a new, richer format. Easier to learn and play than ever before! This is a great game that ripped off Werewolf. You deal out the character cards, one person will be the sheriff, and depending on how many players you have, you can have up to 2 deputies, 3 outlaws and a renegade. If you like to get into the theme of a game, this can be very fun. Very good filler game. I'm going to need a new deck soon because we have played it so much. An easy game to learn. Makes a great filler game while waiting for people or at the end of the night. Bang! is an amusing card game with a western flare. Even those members of the family who don't understand the strategic aspects of the game love the zany action. Bang! is always a hit on game night, and we usually play a few times! The game itself is easy to play, easy to understand, and tons of fun. The fact that it's cheap is just a bonus! This was my gift of choice to give during Christmas 2003. Bang! is a great game to play at a party or with a decent size family. If only there were an expansion to play with more players. This is great fun. There is a little strategy involved, but what makes it hard is you don't know who your allies are or who's truly out to get you. Its best to get the expansion, "High Noon!" when getting this, as it is inexpensive and adds a new level of play and fun for the whole crew. A great game that plays quick. One of the few games that plays better with more people. It has a high level or replayability. I originally bought both the base game and Dodge City expansion, but I find with our friends, the base game works better by itself, although we still use the characters and a few of the blue-bordered cards from Dodge City. The game is at its best when people are playing fast and loose, without too much thinking and strategizing. I bought this game understanding it is one of the top twenty games listed on many websites. Most of 2009 went by waiting to buy the game due to its lack of availability within the U.S.A. otherwise it would have cost 2-3x more. Finally, the game arrived and I was not disappointed. My friends and even my wife, who does not play most games I like, loved it. One friend and his wife left our house and bought it online over their phone web connection who found that even their parents love it. What more can be said? When you see a game that is so authentic with its cowboy theme that it is in part Italian, you know you have a great game! This game shines with 6 or 7 players. But thick skins are needed. It's possible to be eliminated before your first turn! This is a game to play for fun with people who aren't looking for a deep strategy game. Kids especially tend to love it. Serious minded adults should look elsewhere. Very thematic game for a large group of players. Rather slow gameplay combined with built in player elimination is a drawback, though. Bang! is an excellent party-feeling game that has only a slight bit more depth to it. Working great as an introduction to the world of gaming, I've often used it as an ice-breaker with a new group of friends. With that being said, if you've read about Bang! and think that the card playing and theme will work for your group, I highly recommend going all out and purchasing the Bullet edition. It's worth it! Bang! is a great crowd pleaser for lightweight gamers (or teens) who crave a bit of "take that" conflict in their games. My high school club can't get enough of this game. Bang! is a great party game for 4+ friends, and the only bad thing I can say about it is that - while it's top of the list for six or seven people - it inherently can't be scaled down. 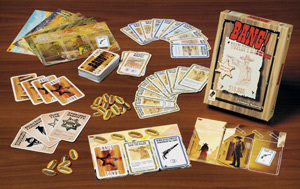 If you like the Spaghetti Western theme, the base game is best with characters and maybe a card or two added from Dodge City. This is one of my favourite games to pull out when we are a larger group (6-7 players) and we all want to play something together. Other games have tried to mimic the excitement of the hidden roles with simpler or more streamlined gameplay, but somehow none of them have managed to achived the immersive theme that makes Bang! such a blast to play. You have various guns, beer, sherifs and outlaws - you are practically in the Wild West - and it works as a fun and exciting game. Bang! is a great game for more players. If you have an excess of players and a lack of games, this is the one for you. Fun party game. I'll play if it hits the table.